Without different companies, we wouldn’t be able to get products, food, and services. More importantly, without businesses we couldn’t work and earn a living. It all ends up being a complete circle, because the most important aspect of any business is the workforce that powers the business. People who are passionate about work are the best reflection of any business. We partnered with Kronos to share one of many examples of the perfect, passionate member of a workforce. Being passionate about work matters; it sets you apart from the rest and lets your personality shine in everything you do. As a miner & Environmental Manager, Dana Sue Kimbal is the perfect example of a passionate member of the workforce. Running an operation that runs 24 hours a day, 7 days a week, 365 days a year is not an easy task, and requires a high level of passion. 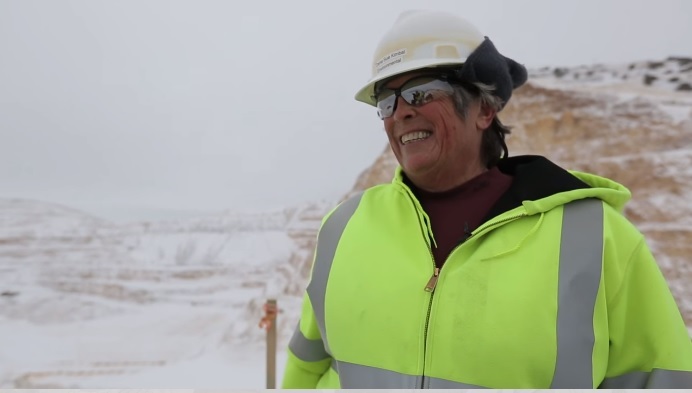 Dana Sue Kimbal works at the Coeur Rochester mine where she and her team move 70,000 tons of ore every day. The type of ore Dana deals with the most is silver, but occasionally there is gold to be found. Every year, Dana and her time produce a total of 4 million ounces of silver. The silver that Dana Sue and her team produce can be found in many objects and you may even have some in your home. The metals are used for coins, jewelry, the solar industry and any product that utilizes pure silver. Every day Dana is faced with many tasks, but you’ll find that there are three main areas: compliance, permitting & planning for the future, and planning for closure & reclamation to make sure when they close a site, it’s as close to the environment it was before they began. In each daily task, Dana shows a high level of passion for both the task and the overall goal. Dana didn’t initially want to be a miner instead, she wanted to be a park ranger. Once she graduated college, a job opportunity came up in northern Nevada. That’s when she started in the mining industry, and it grew thanks to her love of the outdoors. That love and passion for nature helped Dana Sue find a home in the mining industry ensuring that every site is left the way it was when they began. Ensuring a safe and bright future for mining everywhere. There’s an industry saying, “If it isn’t grown, it has to be mined.” and Dana Sue mined through the industry until she found an aspect that she was passionate about and let it grow from there. Dana Sue is the perfect example of being passionate about work and the ideas that Kronos tries to represent in their videos. The series is called 1 in 100 Million the Kronos American Worker Campaign. In the series, you can watch the full story behind Dana Sue and many others as the exemplify what it means to be part of the workforce in America. Be sure to see the other 1 in 100 Million examples we have shared along the way; these individuals inspire us all! Being passionate about work is so important. You won’t do your best if you don’t love what you do. Passion is my greatest strength and my worst enemy! I think this is a very valid question for a lot of people. My husband being one of them. He feels very uninspired at this time and I keep asking him what are you passionate about? Wow, I want to be Dana when I grow up. You can always tell when someone loves what they do, because they’ll do more than they’re supposed to without being asked. You can tell that Dana believes that work isn’t the enemy, and that’s a great way to be. Sometimes I feel like passion is a lost art. I love seeing the passion that my son has for life – it inspire me to be more passionate about my job, home, and life! I love this!!! If you aren’t in love with what you are doing you won’t be happy at all at life, passion is so important in all aspects of life. . This is so true and explains why we have any teachers in the classroom. I know as a teacher my passion is what drove me through the hard parts of my job. If you find something you love to do you will never work a day in your life! So important to find passion in your work! Environmental work is one of my passions and though I’m not directly involved in the field, I still do what I can to minimize my impact. Passion can help get you through a lot of things, work included. It is impossible to be truly successful at work if you’re not passionate! I love having my job now because I am finally passionate about what I do! Everything is more enjoyable with passion. I taught my kids from the get go that having a job/career that they love is more important than having the big bucks. Not that they shouldn’t earn good money but that they need to enjoy the work. Passion. It makes everything and everyone better. Passion is essential in every area of your life, both work and play. I can’t imagine loving my job if I wasn’t passionate about it every day. I have other things I am passionate about. Now that I am blogging I am finally passionate about something. Never was before when it came to work.